paronychia - WELCOME TO ERS 4 KIDS !! A paronychia is a superficial infection of epithelium lateral to the nail plate. The acute painful purulent infection is most frequently caused by staphylococci but commonly has mixed aerobic and anaerobic flora. A paronychia infection usually starts in the lateral nail fold. Cracks, fissures, or trauma to the nail fold allows bacterial entry through the skin barrier. Patients at risk include those with dyshidrotic eczema, contact dermatitis, and those with chronic dry, chaffed, or irritated skin such as dishwashers, florists, gardeners or housekeepers. 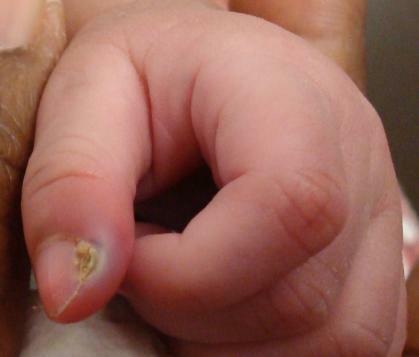 Occasionally, the infection includes the complete margin of skin around the nail plate. It results from mechanical separation of the nail plate from the perionychium. Early in the course of this disease process (<24 hrs), cellulitis alone may be present. An abscess can form if the infection does not resolve quickly. The treatment of choice for a paronychia is incision and drainage. Provide warm compresses or soaks. Keep fingers clean and dry. Antibiotics are not necessary if the incision successfully achieves adequate drainage and no cellulitis is present. Most paronychia infections can be managed without antibiotics. Over-the-counter analgesics are usually sufficient. If cellulitis is present, antibiotics are indicated. Penicillin is probably the first-line agent, covering oral flora well. In consideration of allergies and contraindications, an oral cephalosporin agent may be considered for outpatient treatment. Clindamycin may be considered to cover methicillin-resistant Staphylococcus aureus and anaerobic organisms. Combination therapy with an IV agent that provides antimicrobial activity against staphylococci is used for inpatient therapy.